I remember when I was a kid and I would see a new toy or book or anything else that caught my fancy, and I asked my parents to buy it for me, their answer would almost always be NO. Then maybe on pleading, negotiating, insisting or even throwing a tantrum - I would once in a blue moon get what I wanted. One would think that the parents didn't want to spoil the child or waste money on useless things. But it is soo much deeper than that. While we're under our parents shade and guidance, we feel confident, positive about life and that nothing can ever go wrong. But when kids start getting exposed to the outside world.. Right from school days, to independently commuting to school/college/tutions/classes and later doing grown up things like getting a job or going for higher education - reality hits. Life isn't all that easy, people aren't always good or kind. There are obstacles, you won't always get what you want and things may sometimes look bleak. Back then because we were already used to not always getting what we want, we would be alright. Forget or get over it or find a way to earn it. But today, we as parents of this generation with most probably a single child, give our kids whatever they want - out of guilt for not spending enough time with them or because of impatience and not wanting them to throw a fit or create a scene or even because we want to give them everything because we can afford it. How wrong are we! With all the recent (and not so recent) suicides committed by children due to failing an exam or being lonely or not meeting their own expectations I can only try to figure where are we as parents going wrong. And the answer lies right in front of us. Not spending quality time with the kids (going shopping to the mall or going for movies etc hardly counts). Giving them a gadget too early in life whilst being on another gadget ourself giving excuses to self that it's important work or it's necessary to finish this right now at night.. Not teaching them that failure is as probable as success.. That sometimes you have to settle for not getting what you want. Be it a toy or school of choice or a vocation of choice. I am guilty of doing this too. Mostly out of being worn out and tired all the time. But every time the news or viral video of another soul ending it's own self comes to my eyes, it's like a bolt of shock. It's like ice cold water hitting my face asking me to finally wake up from whatever deluded world I'm living in where I think it'll all be fine without me doing good much. Also, if you're a blogger/influencer reading this - we spoil our kids further with all the freebies/special invites and other privileges. We need to be careful and make them feel they have earned the privilege or else later in life reality will hit hard and how! Next time my toddler asks me for something I'll say No, not today. He'll cry, he'll yell and be angry. I'll let him. I'll calmly try to explain to him that he cannot get every thing he lays his eyes on and has to earn things by doing tasks. It will be difficult. It will be frustrating. I may even want to pull my hair when he shrieks and cries, but I will try to remind myself the greater picture I am trying to create. I'll keep my phone and other gadgets away when I'm home. If he asks for the iPad or phone I'll tell him it's at office. Sorry if I don't reply to your messages people, I'm sorry if I cannot do the work at hand on priority. I'm sure you will understand. P.S. - I wrote and published this from phone while in commute so please excuse any grammar/spelling mistakes. It was my parent’s 30thwedding anniversary last weekend and I wanted to make it special and memorable for them. At the same time we just had the weekend to us as with busy work schedules no one could take a holiday. 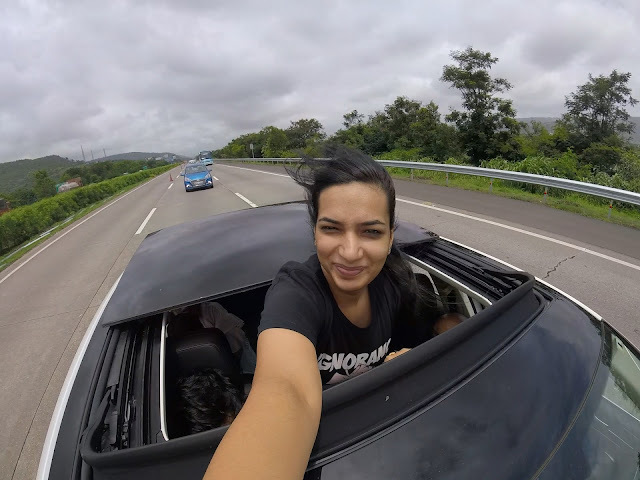 I was exploring resorts & hotels around Mumbai – Lonavala, Khandala, Karjat, Pune, Alibaug, but any hotel is a typical food + pool + room kinda stay and I wanted something different for the occasion. 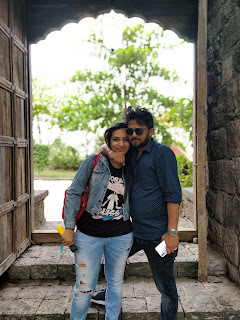 I had been wanting to go to Fort Jadhavgadh, which is a little ahead of Pune since long, but because it is expensive and also that it’s far we never ended up going. But I really wanted to go and finally booked 2 royal tents (chhavanis) for the occasion. FYI, they don’t mention anywhere that the tents are a little bit of a walk from the main fort. So if you have anyone who has physical issues, trouble walking – please go for the rooms/suites and not the tent. I would have myself opted for the rooms if I knew. My parents were a little tired at the end of the trip with all the walking. Google maps showed that the destination was 3 hours away from Kharghar, Navi Mumbai – but in actual it took us 5+ hours to reach thanks to the weather and traffic! 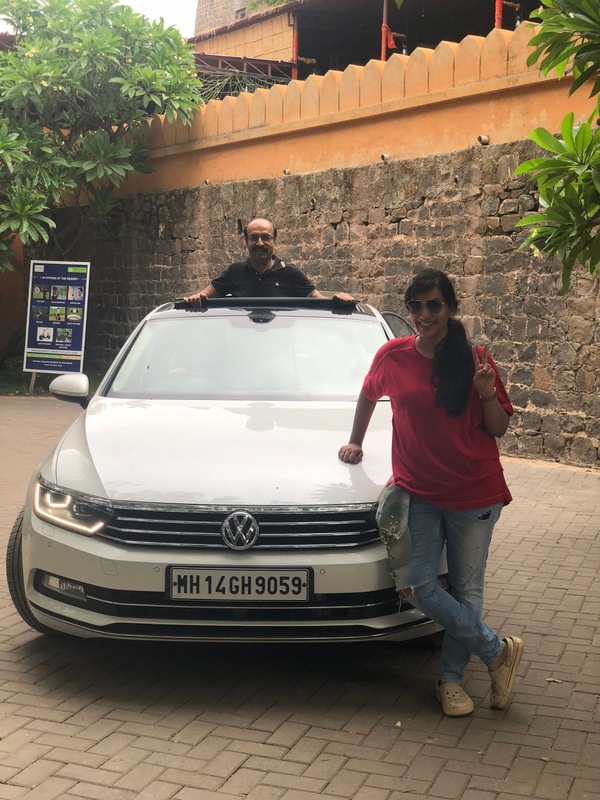 Thank god that we had the comfort of a luxurious car so that we weren’t tired at all upon reaching Fort Jadhavgadh, or else the whole trip would’ve been spoilt. Saviour of the day was Volkwagen Passat that was given to me for the weekend! 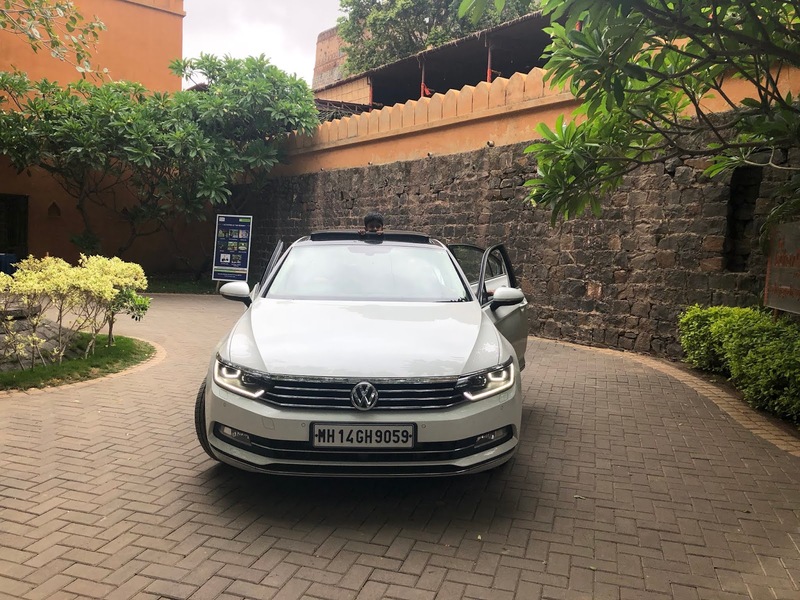 The 8thgeneration Passat with park assist, hold-assist, 9 airbags, sensors, a surround sound speaker with multiple tweeters and a lottt of other lifestyle features and a sun-roof made the travel comfortable, royal and fun! A head-turner model with interiors that are as stylish as the exteriors! I absolutely loved the wooden finish on the dashboard, details like sunglasses holder, 360 degree camera view of what is there outside the car, a multi-function steering wheel which gives all the controls right on the steering wheel and a boot that opens from the foot via sensor! And opening the sun-roof and enjoying the pleasant breeze was just amazing – even my young at heart parents enjoyed that. Though getting up there is not very comfortable. We reached and checked-in around 3.30-4pm (they welcome you in a royal way with tutari and a tika). Please remember to carry ID proof for everyone. My mom didn’t have hers (forgot it in the photocopy machine at home and doesn’t carry PAN card), because the manager didn’t let us go to our tents till that was sorted. (Yes, we were on the road for hours, conveyed that to the manager, but he was adamant to have ALL the IDs, we had already given the other four). We were shown to our rooms and given the list of activities available as a brochure, but here was another issue. We assumed all the activities were available all the time, but they had specific timings which we didn’t ask and the hotel staff did not tell us. So pottery, mehndi, bullock ride, trek etc all only once at a specific time – not knowing of the same we missed it all. So please make sure you ask the staff to tell you what time is what. Oh and you will see a lot of bugs and creatures - I had a blast showing them to my toddler, as you don't get to see them in the city. Caterpillars, butterflies, frogs, chameleons, snails etc of all shapes and sizes! I heard that you even spot rabbits, deers and foxes if you go for the morning trek. Apart from that, the fort is MAGNIFICENT. In full glory, very well preserved with all the underground tunnels and verandahs.. It was lush green and stone and the weather was beautiful (not raining but very cloudy and windy making it perfect). There are huge sprawling lawns of green grass for you to rest, play or do anything. There are some swings and a hammock for you to laze around or you can just lie down on the grass. They have games like football, badminton, lagori, cricket etc equipment lying for you to use. My mom and dad teamed up with other guests and played lagori, my mom had a lot of fun remembering her childhood days! We decided to next take a dip in the temperature controlled pool – but even after it being temperature controlled, it was cold due to the cold breeze outside and height, so thought adults are okay, you need to be careful with the kids. My toddler’s lips started turning blue in 15-20 minutes and we had to get him out of the pool. There also is supposed to be a poolside bar called Kund, but couldn’t see any bar in open, but they do serve drinks if you order. We chilled with some chilled beer. There is a really old tree right in the middle of the pool and hence the pool has a shade all the time, so you can even come in the afternoon without worrying much about getting tanned. We had dinner at Chhajja – all day dining. Instead of sitting inside, we preferred the outdoor sitting which was more peaceful and dim, with nature’s sounds of crickets, frogs and bats the only thing to hear. On display as décor were utensils and ornamental décor from the royal times centuries ago. The food was really nice – we had the Fort Jadhavgadh special kanda bhajiya, paneer handi and dal tadka with assorted breads. Quantity is very nice and it was a wonderful hot meal. We had a surprise for the parents with balloons, a home-made cake, flowers, greeting card etc so we asked them not to go to sleep. They loved the surprise and we took some pictures, wishes them and called it a night because we wanted to get up early. The morning weather was absolutely beautiful. We decided to take a stroll around and took some pictures. You should do the audio tour, and you will cover all the places of the fort, so you can take pictures everywhere you go. We then headed for the buffet breakfast at Aangan – the courtyard café. The spread and variety was nice – cereals, baked items, south Indian, Maharashtrian cuisine, eggs, filter coffee and more. But because it was crowded the service was a little slow. They mention that they get live counter orders to your table, but in that chaos they never came to our table, so you might as well stand and wait for your order at the live counter – or else come really early and have your breakfast. We then completed our check-out procedures, and then chilled a bit in the garden area. There is a 300 year old temple which you can visit. There is also a small kid’s garden next to it. Infact if you’re not in a hurry, you could stay around till late afternoon and head back. We started back for Mumbai at around 1.30pm (Mom wanted to apply the mehndi which happens at 1pm) and halted at Sunny Da Dhaba for a very late lunch and reached home by night because of the traffic situation again. The audio system in the Volkswagen Passat was so amazing, we played high-bass and intensity songs on the way back and I felt I was sitting in a moving music concert! We were 3 people and a toddler on the back seat but it did not feel cramped up at all due to the massiveness of the car’s size. Also, the boot size is really huge too, it can take all the luggage you would have as a big family with kids quite easily. That’s a major plus too. Everyone around were staring at the car which only tells you how beautiful it looks. Thank you Volkswagen for making our parent’s special day even more memorable. My dad now officially has this car on his wishlist! 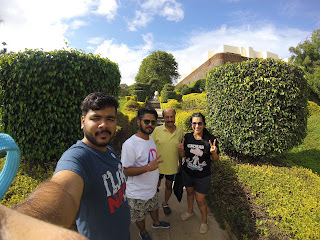 If you guys are looking at going to Fort Jadhavgadh, I suggest going for 2 nights so that it’s worth the travel and so that you can do all the activities they have. Don’t forget to book rooms and ask for activity timings in advance though! You can opt for their special packages which include meals – I think that will turn out as a better deal.